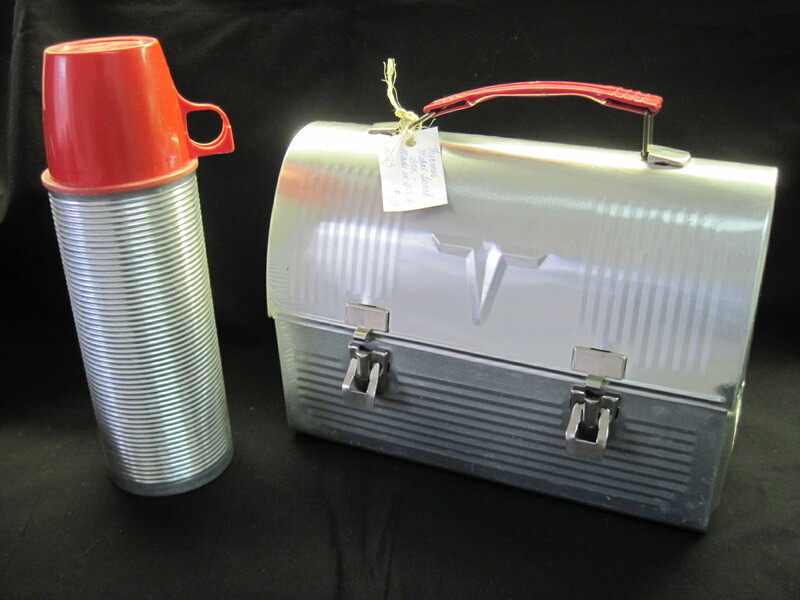 The lunch box and thermos was a staple for working men throughout the1900’s and this particular model dates from the 50’s to the 60’s. This is the Thermos Brand, made in USA. You can read all about how people started to use lunch boxes on the Wikipedia site http://en.wikipedia.org/wiki/Lunch_box. It makes for very interesting reading. The thermos pictured was not original to this lunch box but it is the model that went with this particular lunch box at the time. The lunch box has a few dings and obvious wear. The thermos is also quite well used, the plastic lid slightly faded and the red plastic rim quite discoloured. Still, they make an interesting and fun display. Priced at $15 for the pair. A great deal!! Please note: These items are now SOLD! !